You know how you feel. So do they. Join PatientsLikeMe to compare treatments, track symptoms, and get advice and support from the ones who understand Huntington's disease most: those living with it. "PatientsLikeMe empowers patients with its symptom and medication tracking capabilities and guides. They enable patients to be proactive and participate in deciding the direction of their treatment, rather than just waiting to see what the doctor will suggest." "No other site or forum compares to PatientsLikeMe. Share your story, what treatments have worked or not, ask tough questions and get real answers from people living with the same illness." "Since joining PLM I have found support, courage to let others know what it is like to have a condition like mine." 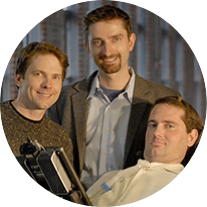 "Our brother Stephen was living with ALS and we thought, ‘there has to be a better way.’ There is." Tracking the symptoms of Huntington's disease helps our community manage their health today and helps researchers shorten the path to new treatments tomorrow. PatientsLikeMe is committed to putting patients first. We do this by providing a better, more effective way for you to share your real-world health experiences in order to help yourself, others and advance research.